Get your Free Basketball Coaching Book (digital download) right here. 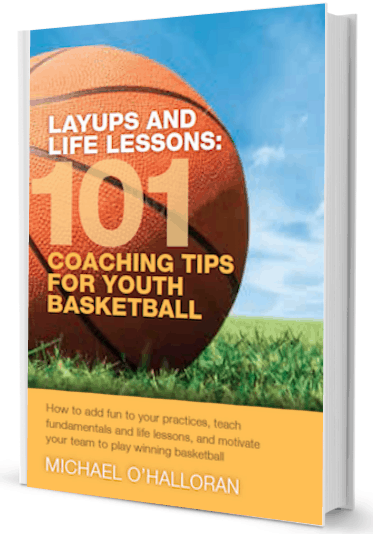 Get your FREE digital download of Layups and Life Lessons: 101 Coaching Tips for Youth Basketball. If you’re coaching a youth basketball team, this is the book for you. Learn tips and techniques for teaching, motivating and inspiring your basketball team. Plus, some hard-earned tips on strategies and tactics to use in practices and games. 92 pages. We’ll send you a link immediately to download this digital e-book. Don’t worry, we won’t share your email with anyone. Occasionally, we will send you some special offers and news. You can always opt out. To learn more about this valuable guide for youth basketball coaches, check out this Layups and Life Lessons excerpt. There’s something for experienced coaches – glean a great practice tip or technique. And, it’s a perfect starting point for volunteer coaches without years of experiences. Author Mike O’Halloran has coached 15 youth basketball teams. He’s the author of Youth Basketball Practice Plans and Never Forget They’re Kids, and the editor of SportsFeelGoodStories.com.